Breastober is a movement started by The Princess Margaret Cancer Foundation to raise awareness for breast cancer. Cindy Goelman started the Breastober movement last year. “I wanted to raise the profile of our breast cancer program which is world class and making a difference in many families lives,” Goelman said. Sealed with a kiss party is happening on November 25. Photo from Breastober Instagram. Throughout the month of October, special events will aim to raise money for cancer research. In November they are hosting the Send a Kiss fundraiser. “The Sealed with A Kiss Party is the culmination on the many initiatives taking place during the month of October to support Breastober,” Goelman said. They have a goal of raising $20,000 for cancer research and the breast restoration program. Breast cancer is the most common cancer in Canada. Twenty six per cent of cancer diagnoses are breast cancer for women. While not as common, males can also get breast cancer. That’s why Goelman says raising awareness is so important. “Raising awareness will help our general population look out for the warning signs of breast cancer – one in nine women will get breast cancer in their lifetime and many of those will be treated at Princess Margaret Cancer Centre. We have a large team of oncologists, surgeons, radiologists, clinical trials and programs for after treatment to help all the patients,” Goelman said. 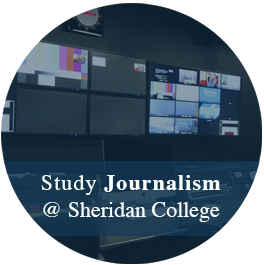 Sheridan Breast Cancer Awareness Week is from October 10 to 20. Photo from SSU website. “Bringing awareness to breast cancer, any cancer or any issue only helps to make the whole country more sensitive to symptoms that are occurring so that they can check early enough to be treated and hopefully cured,” she added. 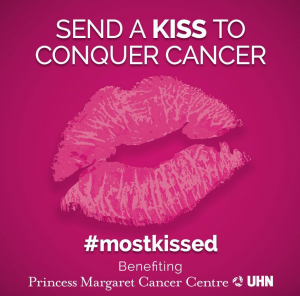 The Princess Margaret Cancer Centre is in the top five cancer research centres in the world. Sheridan is also having a breast cancer awareness week from Oct. 10 to 20 outside the SSU clubs room. Bethel Ann Galindez helped organize the event. “Everyone in the Student Union is doing their part in trying to generate awareness for this in any way they can. We are fortunate enough to have volunteers from the Cancer Society to come to each campus to set up information booths at the upcoming clubs fairs in Davis and TRC, and for a Facts V.S Myth engagement we are having at HMC,” Galindez said. Galindez has a personal connection to this fundraiser. Her mom was diagnosed with breast cancer when she was three. “Growing up I watched the cancer go away and come back. I watched how it affected, not only her, but everyone in my family. She passed away five years after being first diagnosed. She was only 37 years old,” Galindez said. She says that events like this are important because they teach students to act proactively. “Educating students on preventive measures, i.e promoting a healthier diet, or at least helping them be aware of ways they can support – could impact and help another student’s life,” Galindez said. You will be able to decorate a tree with pink ribbons during the week. 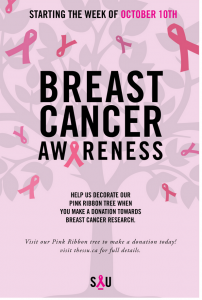 “The breast cancer awareness tree is meant to symbolize unity (which is our October awareness theme). For all those who donate, they have the option of hanging up a ribbon for someone that they know, or taking a ribbon to carry with them to also show their support,” Galindez said. Donations will be taken in support of breast cancer research. All donations will do the Cancer Society Foundation.